Provide comfort for the family of Doris Tugnette with a meaningful gesture of sympathy. Peacefully entered into rest on Saturday, February 16th, 2019 at the Belleville General Hospital. Doris Tugnette (nee Flunder) died at the age of 85. She was the daughter of the late William & Madeline Flunder (nee Parks) and beloved wife for 64 years to Thomas. Doris was the cherished mother of Eric Tugnette(Letty Naven) of Belleville, Tim Tugnette(Lisa) of Kingston and Cindy Tugnette. She is the loving grandmother of Erica(Stacy), Cheryl-Lee(Michael), Cassondra, Thomas(Beth) and Ashley(Jory) and great grandmother of Brandon, Jenna and baby Mya. Pre-deceased by her grandson Mathew and her great grandson Tyler. Doris is predeceased by her brother Gary Flunder and she will be fondly remembered by her many nieces and nephews. Consider providing a gift of comfort for the family of Doris Tugnette by sending flowers. Cindy, I am sorry to hear of the loss of your Mom. She was a lovely woman. My sincere sympathy goes out to you, your Dad and your Brothers. Greatest Sympathy to Tom, Eric, Tim, Cindy and your family. 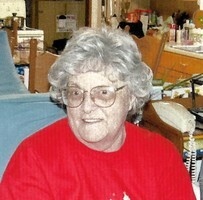 Doris was a long time family friend who will be greatly missed. Our thoughts and prayers are with you. Our Sincere and Heartfelt Condolences to the entire family. Freddine Horn … Chris Johnston & Gary Cox.